The explosion in content creation is partly due to the fact that nearly everyone has a pretty decent camera on their phone, so shooting relatively good video footage is simple as is distributing it to the internet. In addition brands are seeing that users are much more likely to engage with video than other media. It's already a profitable business, for example a YouTuber, with around 1 million subscribers, can expect to earn c. $100,000 per annum with a steady stream of content uploads. Traditional TV broadcasters have been experimenting with online video to add an extra element to programming for a while. A couple of years ago we worked with Channel 4 on some wildlife projects, with a programme on the channel every day, supplemented by a live 24 hour feed that ran for a week. The engagement on social media throughout the week was large with people glued to the live stream. I think we will see a dramatic increase in these types of projects over the coming months, partly thanks to Facebook's live video API. 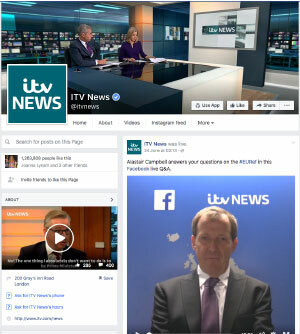 We have already used Facebook to deliver complementary streams for programmes such as Coronation Street and EastEnders to large audiences. A really interesting example was when we helped Fox broadcast the first episode of Outcast, live to Facebook, making it simultaneously available in 61 countries and 22 territories, two weeks before its premiere on TV. The rest of the series is now being distributed via the traditional channels worldwide. Another area which is already using live video successfully is politics. During this year's EU referendum, we worked with Buzzfeed and Facebook to deliver live Q&As with prominent figures from each campaign. Throughout the night of the referendum we also worked with ITV to deliver a number of interviews with leading political spokespeople as the results came in. By the next general election, I expect video will play an even bigger role, both for the broadcasters and also from the political parties themselves. The way in which consumers engage with video is also changing. It's no longer enough to publish a video and hope consumers will find it. Due to sheer amount of video content available, creators need to understand not only how to make content appealing to consumers but also how to make it engaging. By far the biggest factor in changing consumption and engagement habits is social media. I have long been preaching that social media is the perfect companion for streaming, with a ready-made network to get you more eyeballs on your video. Add to that the ability for people to share, comment, ask questions, discuss your content, and react to your video from within social media and you have the perfect, ready-made environment for not only engagement with your existing consumers but also the opportunity to engage with new audiences. We have found that having video in a social media platform greatly increases the chances of consumers watching your video with the length of time a user views content being greatly increased over content just viewed via a website. The networks themselves realise it too and there has been an absolutely massive amount of investment into video by the social media giants. None more so than Facebook, which has been investing heavily in video technology, and with Facebook Live, allows a produced Periscope-style approach to sharing videos with fans from anywhere in the world. The live video API launched in April by Facebook is encouraging more broadcasters to deliver engaging content onto the platform as it offers the capability to deliver high quality multi-camera content directly to the consumer. The future promises to get even more exciting for streaming and I think we will see more broadcasters, content providers, and companies streaming live into social platforms on a regular basis. Social networks will continue to invest in making this process even easier and adding interactive functionality to drive engagement levels.